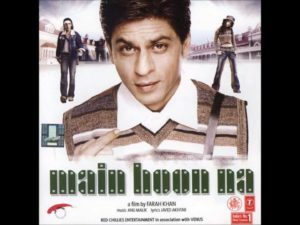 Episode 6: Main Hoon Na - A Reel Education: The Musical! SRK in MHN, as the locals would say. It’s our first Bollywood! I mean, not our first – all three of your hosts have seen at least one Bollywood movie. But it’s our first Bollywood episode and it is the delightful MAIN HOON NA (“Trust Me, I’m Here”)! Windy was super-duper excited to show this one to Mike and Vinnie. Farah Khan’s 2004 directorial debut is an homage to action tropes with awkward fish-out-of-water comedy plus family melodrama. Shah Rukh Khan, one of Bollywood’s brightest stars, gets to show off wire work, stunts, dancing, crying (he cries so beautifully), dimples, and some laugh out loud comedy. Featuring four ludicrously entertaining dance numbers (plus a couple heartfelt ballads), this is an excellent “starter” movie if you’ve never watched Bollywood before. If you are an experienced fan of Bollywood, but have never seen it, you are missing out on some of Farah Khan’s best choreography and staging! Not sure about committing to 3 hours of entertainment? Trust us, we’re here – to show you the way. Plot: An army major goes undercover as a college student. His mission is both professional and personal: to protect his general's daughter from a radical militant, and to find his estranged half-brother.